Dubai: Saudi Arabia’s Tadawul index edged higher on Sunday, consolidating its top gainer for the month and for the quarter as traders eye its inclusion in the MSCI emerging market index. 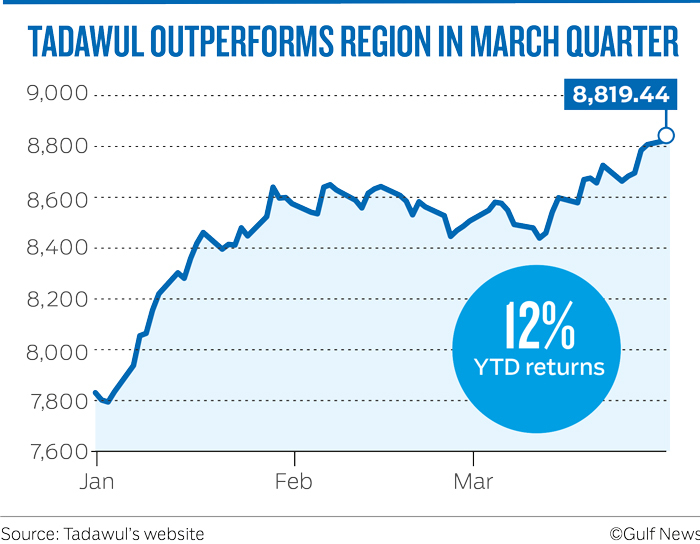 The Tadawul index closed 0.35 per cent higher at 8,819.44. The index has gained 3.4 per cent in March, and has accumulated 12 per cent in the January-March quarter. The index outperformed others in the region such as the Abu Dhabi index, which gained 3 per cent since January 1. “I think the second quarter would match the performance of the first quarter. But we see some pressure in the second half as we would likely see a reversal of flows,” said Muhammad Shabbir, Head of Funds and Portfolios at Saudi Kuwaiti Finance House (SKFH). Saudi Basic Industries closed 0.95 per cent higher at 125 Saudi riyals. Al Rajhi closed 1.69 per cent higher at 108.40. Alinma Bank closed 0.17 per cent higher at 24.26 Saudi riyals. Analysts fear that if Saudi equities would meet the same fate as that of UAE indices, which declined and resulted in outflows after the index upgrade. “The intensity of selling won’t be equivalent to that seen in UAE indices as we would see support from local institution and retailer,” Shabbir said. Banking stocks such as First Abu Dhabi Bank (FAB), Abu Dhabi Commercial Bank (ADCB), and Union National Bank (UNB) on the Abu Dhabi index fizzled out on Sunday as profit-taking kicked in after the stocks turned ex-dividend. FAB closed 0.39 per cent lower at Dh15.20. ADCB closed 1.58 per cent lower at Dh9.33. UNB closed 1.85 per cent lower at Dh5.30. The Abu Dhabi Securities Exchange general index closed 0.52 per cent lower at 5,074.65. The Dubai index saw buying in the first few hours of trade, but weakness in Dubai Islamic Bank (DIB) weighed on the gauge. Emaar Properties jumped more than 2 per cent to end at Dh4.78. DIB closed 1.02 per cent lower at Dh4.85. Gulf Finance House closed more than 5 per cent lower at Dh0.920. DP World closed 1.25 per cent higher at $16.20. Gulf Navigation closed 2.50 per cent lower at Dh0.821. In other stocks, Emaar Development closed half a per cent higher at Dh3.90. “Moving forward, the sentiments of global markets will influence the trading activity within the region but investors will focus on first quarter earnings to take directional positions post ex-dividend trading,” Allied Investment Partners said in a note. Elsewhere in the Gulf, the Muscat MSM 30 index closed 0.55 per cent lower at 3,983.66. The Qatar exchange index closed 0.38 per cent lower at 10,107.42. The Kuwait all share index closed 0.35 per cent higher at 4,872.21. The Bahrain bourse index ended at flat 1,413.32.